Thank you so much for this, Dave! A fellow “Boothie”and I will be attending on the 23rd. We wouldn’t miss this opportunity for anything. We went to a performance on Sunday (June 17). 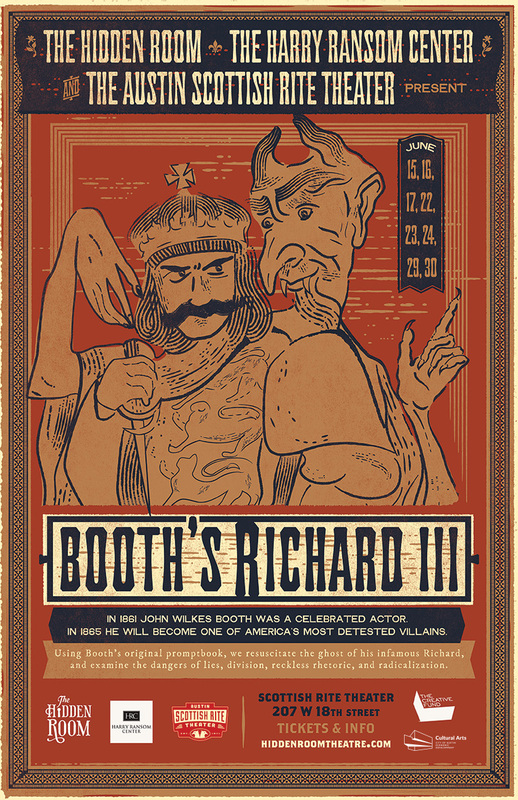 It was great — a marvellous production, very well acted (particularly Judd Farris as Richard III), and with excellent use of the kind of gestures actors like Booth would have made in the 19th century. The Scottish Rite Theatre, where it was performed, was also great — built in the 1870s and with beautiful painted backdrops from the period. Sorry it will have such a short run, and that those of you not near Austin will miss it, but if you’re anywhere near, I urge you to go. This is a bit delayed, but I’m glad to hear you enjoyed the show, Bruce. I hope they take it on the road sometime soon. We attended the play last night, and it was indescribably wonderful! It WAS like stepping back in time. Entering that beautiful old theater with the musicians playing period music, (which patrons would have heard in 1861), set the feel as the play began. All of the actors were extremely talented, and the makeup, the costumes, the gestures and the period lighting! Oh! And let’s not forget the beautiful hand painted backdrops! The director had even worked on the actors voices so that they were speaking as actors would have done during the CW – complete with rolling ‘r’s! Judd Farris was deliciously evil as Richard, and even managed a few humorous interactions with his audience that made this experience a true delight! I took lots of pictures. Too bad I can’t post some of them here. I agree with Bruce Hunt. If there is any way you can see this in person-go! I hope this isn’t the last time they do this play. I want to see it again! Thank you so much for the detailed report about the show. It sounds like you had a wonderful time and I’m envious.